Peel bananas and soak them in a bowl of cold water for 30 minutes before slicing into thick slices (refer to picture). Remove and dry with paper towels. Drizzle extra virgin olive oil generously over the bananas. Add lime juice, garlic, and parsley. Season with sea salt and black pepper. Toss to combine. Line a baking sheet with parchment paper. 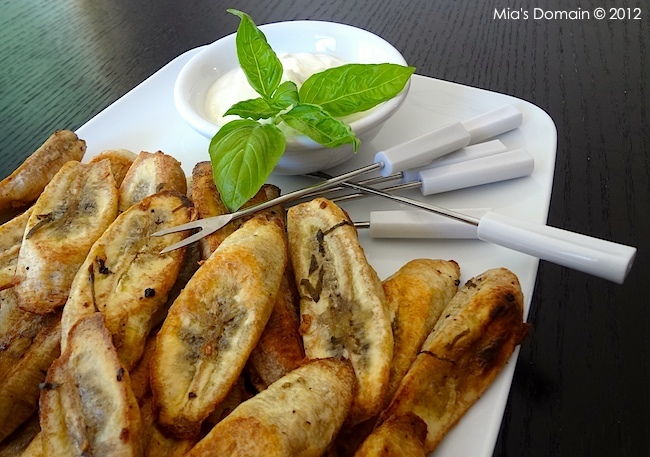 Arrange bananas in a single layer and bake for 1 hour, turning them over occasionally during cooking. Serve hot or warm with dipping sauce on the side. Food Processing – Why Do We Need It? GM Foods: Heading for a Train Wreck?